Potatoes are great. However, when it comes to root vegetables, I generally opt for something that I deem to have more nutritional value – beets, sweet potatoes, etc. Gotta get that extra fiber and anti-oxidants into your diet! I sometime make oven fries, so this time I decided to use a variety of root vegetables in lieu of potatoes. 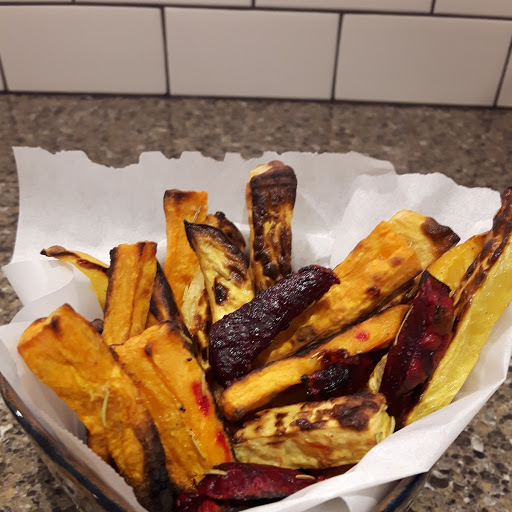 Not only are baked the beet, sweet potato and rutabaga fries delicious, but they look so nice as well. For best results, flip each fry halfway through baking. I am lazy and just shook my pan. As a result they were a little dark on one side but still delicious. I dipped mine in ketchup (except the beets) but any sour cream or mayo/aioli dip would work great too! Serve as a hearty side with anything you like! Peel beets. Cut into ½ inch fries and place in a mixing bowl. Toss with 1 cloves garlic, 1 tsp rosemary, salt, pepper and olive oil. Peel sweet potato and rutabaga. Cut into ½ inch fries. Place in mixing bowl. Toss with 2 cloves garlic, 2 tsp rosemary, salt, pepper and olive oil. Line 2 baking sheets with parchment paper. 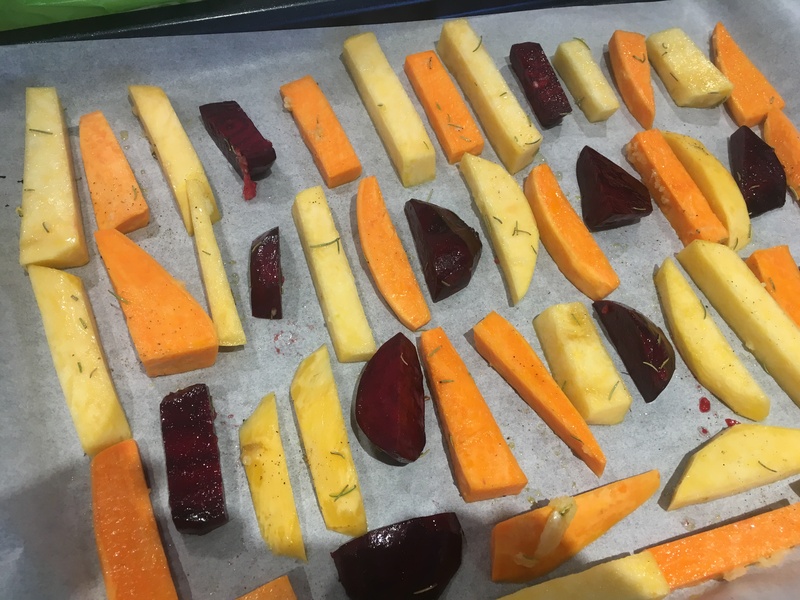 Place fries individually on baking sheet so they are not overlapping. Bake for 40-45 minutes on two levels of oven. After 20 minutes, move vegetables around with a spatula. For best results, flip each fry individually. Switch top and bottom pans and bake for an additional 20-25 minutes until done.